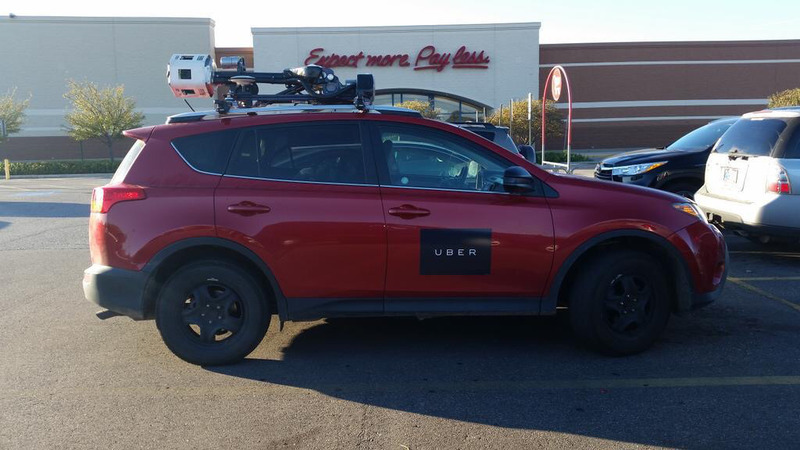 Uber has a car with a bunch of cameras on it driving around collecting images to improve its maps, driving routes, and ETAs, TechCrunch has confirmed. And here are the first photos of it. When asked about an image dug up from a private Uber driver Facebook group by TechCrunch reader Dave Craige (seen below), Uber admitted that this is a mapping vehicle piloted by a human driver, like a Google Street View car, not a self-driving car prototype. The system was originally designed by Microsoft. Uber provided the image above. Back in June, we reported that Uber had acquired "assets" from the Microsoft Bing mapping team, including about 100 employees. But Uber refused to detail exactly what those assets included. One thought was mapping data. But now we know that Uber bought the camera-clad car system seen in the photo above from Microsoft. That way it could generate its own data. Uber tells me the Uber-branded mapping cars have been on the road for a few months. The data they collect is being used to improve the Uber app's route suggestions and estimated time of arrival predictions. The Guardian reported in May that people in Pittsburgh had spotted an Uber self-driving car prototype that was also collecting image data, but Uber tells me that was for its separate autonomous vehicle project. Uber has cars on the road in Pittsburgh and Arizona working on self-driving cars. Knowing exactly how long it takes to get from one point to another is critical for Uber as it tries to build out complex algorithms for making carpooling efficient. Knowing that a certain alleyway is impassible or that an intersection includes restrictions like 'no left turns' will let it better allocate cars to carpoolers, or just give riders a better idea of when to be ready. Uber at one point reportedly submitted a bid to buy Nokia's HERE mapping service, but later dropped out. It has made acquisitions like the Bing assets and deCarta to build out its own mapping expertise. Done right, Uber could give drivers a reliable in-app directions option instead of them instead opening Google's Maps and Waze apps. For now, if you see this on the roads, it doesn't mean Uber is ready to ditch human independent contractors for artificial intelligence just yet. But those camera arrays on car roofs could eventually make your driver almost as efficient as a robot.